This is the fourth in a series of posts on faucet finishes I'm running during my Thanksgiving break. I wrote this series originally in February '09. So if the higher end of the market uses ancient foundry methods to make objets d'art doing double duty as bath and kitchen fixtures, what's available to the rest of us? You know, the same us who bristle at the thought of an $1800 lavatory faucet. Well, that's where our pals at Kohler come in with their modern and efficient production methods. Metal casting and finishing have come a long way since the Babylonians figured out how to cast bronze thousands of years ago. 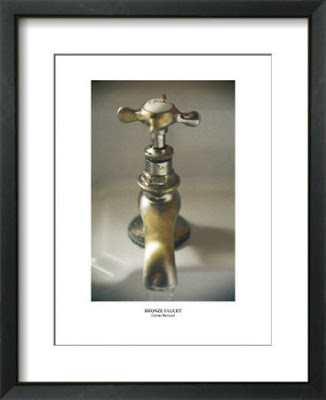 When plumbing fixtures are mass-produced now, they are cast in a variety of base metals (usually alloys of brass), then they're plated and finally, they're clear coated to resist corrosion and to make the finish last a lifetime. All manufacturers have their own, secret alloys and formulas; but the production methods used by all of them are essentially the same. Individual components are cast in a base metal alloy and then polished and cleaned. Then the components are plated with a finish and covered with a clear top coat. Plating takes two forms these days, and the first method is electroplating. Electroplating was invented in the early 1800s and was in wide-scale use by the middle part of the same century. Electroplating uses electricity to deposit a thin layer of metal on another metal. It's a pretty simple operation now, but figuring it out in the first place represented a huge leap forward. An electroplating chamber is essentially an electric circuit. 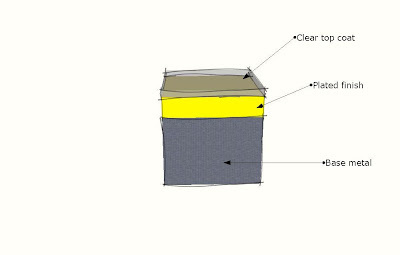 An anode is made from the finish metal, in the diagram above that metal is nickel (Ag). The anode's connected to the positive pole of a battery. 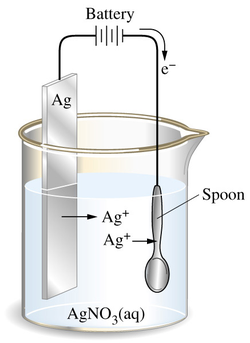 The target for the electroplating (in the example above, a spoon) becomes the cathode and gets connected to the negative pole of a battery. The anode and the cathode are submerged in a bath of conductive solution and the electricity gets turned on. The electricity flows through the solution to complete the circuit. As the electricity leaves the anode, it takes nickel molecules with it. When the electricity lands on the cathode, it leaves the nickel molecules behind. Ta-dah! We have an electroplated spoon. There's a second finishing method called physical vapor deposition (PVD). Physical vapor deposition is a marvel of physics and chemistry but I'll spare you another description of a process here. Suffice it to say that in PVD, the conductive solution is replaced with a gas and the whole process takes place in a vacuum. PVD allows a manufacturer more control over the finished product and by adjusting the mixture of gasses in the vacuum chamber, a manufacturer can achieve a number of effects that aren't possible with electroplating. I bring this up because if you're in the market for a new faucet or two, you will come across the acronym PVD. PVD is never defined and that kind of officious acronym use drives me nuts. So now I know what it means and you do too. Once the plating's done the fixture gets its final color and finish. If the final finish is something like oil-rubbed bronze, then there's a multi-step powder coating process that follows the plating. If a final finish is something like brushed nickel, then the plated fixture has a texture applied to it. The actual finishes always sit on top of a base of plated metal. After all that, the fixture gets a clear coat that's usually cured with heat. It's kind of like a clear glaze on pottery, though the temperatures are nearly so high as that. This clear top coat is what allows Kohler to offer a lifetime warranty on their finishes. Oil-rubbed bronze will look like oil-rubbed bronze forever, brass finishes will never tarnish and nickel will never get any more dull than it was the day it was installed. 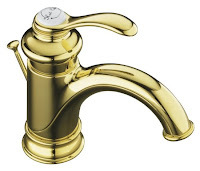 So when you look at this vibrant brass finish from Kohler, you're not really looking at a brass fixture. If you could see it in microscopic cross section, here's what you'd see. These same electroplating and PVD methods get used on all mass-market finishes from brushed nickel to stainless steel, from polished brass to chrome. This is not a bad thing. Plated and sealed fixtures last longer and look better longer than their solid-metal counterparts. So remember that you're talking about finish colors, not finish compositions when you leave the high end of the market behind.